This weekend was a fantastic weekend. It was the MacRobert Tournament which this year was the biggest in the tournaments history with teams coming up from Leeds, Manchester and across from Norway. 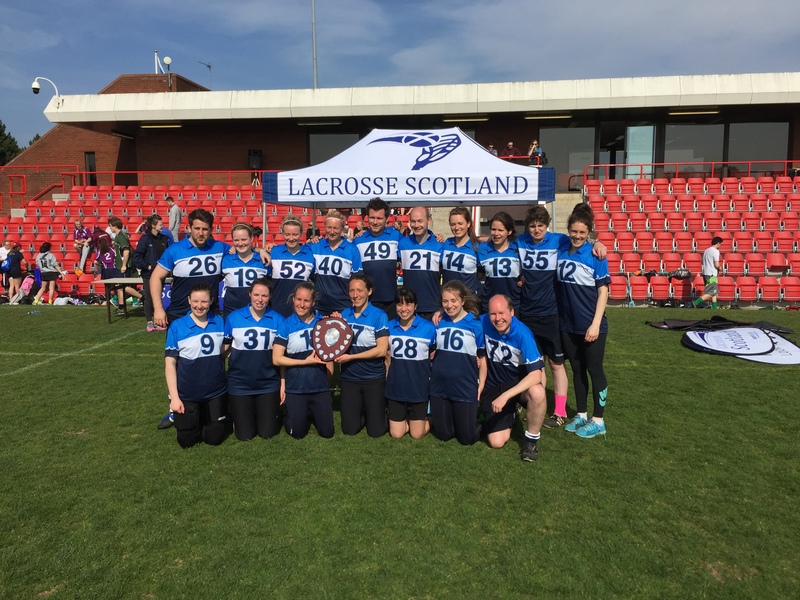 It was fantastic playing just women’s lacrosse as well as mixed lacrosse. Women lacrosse is no different in its rules but you do find there is more stick work skill as some boys (not all though) don’t tend to have the stick work and will just use their speed and the frying pan technique. Saturday didnt go as planned. The weather was not great. It was freezing cold. I played a game and a half and then helped at the come and try session which was running for school kids to come and try not only lacrosse but also shinty. Saturday was a much better day as the weather was great, sun was out and nice warm weather. There were a lot of tired legs around but the team did well and won the mixed tournament bringing our trophy count to 4 for the season. Saturday was not my day though. A BBQ hit me with no prior warning. I say hit me i don’t mean physically hit me but the smoke from it induced a small asthma attack and I had to get my team mates on the side line to run on with my inhaler. Trying to take an inhaler in full goalie kit while a match is in progress is one of the hardest things to do. Overtime I tried to take it the ball would turn over and we were back defending. I managed to get through the game just- thankfully they were only 20 mins long. After the match a couple of nebs and I felt better and ready to go again but once back on the pitch after a few minutes my chest just tightened up. I couldn’t call or anything so I had to get off thankfully our other goalie who was playing out field for another team was changed and could hop in for me. Devastated that that was the end of the tournament for me but it was a real struggle just to get off the pitch so I knew I wouldn’t be able to go back again and play. Thankfully it was such a nice day it was alright sitting on the side watching. It really bugs me that no matter how much preparation you do there are still things which are so small to others can make such a big impact on a set of twitchy lungs. Most people may not notice the smokey smell but my lungs felt it before my nose smelt it!!! Today I have been really short of breath and have a really hoarse voice. It is horrible with this ongoing feeling of tightness and someone constantly sitting on your chest. I long for the day that asthma can be better managed. I thought the end of the season was going to go really smoothly but maybe not. Plan now is to rest and stay low to be well for June where I go to Italy, London and Prague so I need to be in top form for that!! !